We really enjoy Halloween around these parts (witness the entire month's worth of monster-oriented blog entries that we posted only a few short Octobers back), but this year, things are a little different. For one thing, my little trick or treater ain't so little anymore. Still, even though Julie is a senior in high school now, that wouldn't have prevented her from at least roaming the neighborhood with a few friends under the cover of darkness Wednesday evening. No, it was the fact that that's also when she has her twice weekly Physics course at the local community college, and since there's a big test scheduled, she couldn't skip class even if she wanted to! So, yeah, there goes another marker of childhood--I'm not sure who's more bummed, her or me (answer: me). Oh well; at least she's doing very nicely in her class (and if you'll permit me a bit of parental boasting, we recently learned that she scored a 750 on her math SATS, which, they tell me--who never got past ninth grade trig--is a pretty decent total...). Halloween isn't totally forgotten around here, though. For one thing, I continue incessantly spinning those two discs of monstrous novelty tunes that I copped off the web three years back (October 23rd, 2004 entry). I just LOVE listening to the likes of "Graveyard Rock", "Monster Surfer", and the ersatz hipster beat poetry of "I Dig You Baby", though the truth is , these ditties wear far less well on the nerves of wife Lynn, who can't wait til November 1st rolls around! Hey sweetie--after that, it's only three weeks until we roll out the Christmas CDs! Several years ago, a number of moderately priced DVD sets were issued, each one collecting a classic Universal monsters entire cinematic oureve on two discs. I picked 'em all up, planning to settle in during the weeks running up to Halloween and watch each and every film in the order of when it was originally released. Nice idea, huh? So this year I just figured, why not at least sample a few of those collections? Because, with the notable exception of "Bride of Frankenstein"--my all time favorite of the genre which I'd seen many times and as recently as six or so years back--and the original "Mummy" and a lumbering sequel viewed about a decade back on Turner Movie Classics (back when our cable still had TCM), I hadn't seen any of these movies since I was a teenager--and in the case of "Creature From The Black Lagoon", had NEVER seen! So over the last few nights I've watched (in this order) "The Invisible Man", "Frankenstein", "Dracula", "The Wolf Man", and the aforementioned Creature. One thing that sorta stunned me while watching "The Invisible Man" (which was a lot better than I remembered it being) was that, mid-way through, I immediately recognized an unbilled Dwight Frye, who has a mere two lines as a bespeckled reporter with a slight lisp! Geez, I hadn't seen the guy on screen in over three decades, and yet I knew who he was right away (and yeah, I double-checked his resume of the IMDB--I got it right)! I guess that says a lot about the power of those old monster magazines I collected in the sixties (which I HAVE looked at in the intervening years)--who else but a latent monster maniac could spot the likes of Frye so easily in such a tiny role? 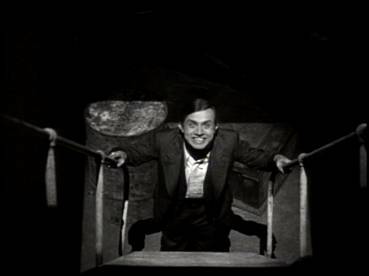 Of course, he then turned up in my next two creature features--as the hunchbacked Fritz who rather unwisely tortures the monster in "Frankenstein", and as Renfield (seen above coming up out of the hold as the only only living--if not sane--survivor of the Count's trip across the seas), he practically steals the film from Bela Lugosi in "Dracula". And "Creature From The Black Lagoon" was a lot better than I expected it to be (I definitely plan to watch the two big-screen follow-ups in the very near future), and unlike Larry Talbot's debut, didn't stint on showing us the star of the show. My one complaint was that the Gill Man--a brilliant conception--is nonetheless sorta cuddly looking and not all that scary, sorta blunting the fact that he's killing off the cast one by one. One thing all these films had in common (save for "Frankenstein") was how, with the demise of the monster de jour, after maybe a quick shot of the hero and heroine in a relieved clinch, "The End" immediately flashes across the screen! Excuse me if I'm longing for a little bit of an epilogue (and that DOESN'T include Henry Frankenstein's dad intercepting a gaggle of nurses outside his son's bedroom and drinking the glass of wine they had prepared for the recovering scientist!!). Well, anyway, the weather looks to be conducive to a nice turn-out tomorrow night--a high of 67 is expected--so let me wish you all a Happy Halloween! And Julie--good luck on that test! This story has been making the rounds on the web in recent weeks--my good buddy, Terry Austin forwarded the link to me, after a friend had sent it to him--so you may already have seen it. If not, though, I strongly suggest you check it out, as it's a truly bizarre example of how sometimes, what you think is real on the Internet isn't even remotely close to being the truth--plus, none other than Harlan Ellison plays a supporting (yet pivotal) role in the proceedings! What's not to like? Sorta reminds me of that old saying: "In God we trust--all others please use PayPal". Up for sale over on eBay is a genuine Hembeck redo of Steve Dirko's classic cover for AMAZING SPIDER-MAN #11 featuring the return of that terror of the dining table, Dr. ("No need to pass those mashed potatoes, fool!") Octopus! And if you're just interested in looking and not buying, here's the link for you!! Well, gotta go now--I have several other web-identities to maintain, after all. Hmm, which shall I be first--the 26 year old Wiccan with the implants and the trained bat, or the gay Republican stock-broker with a deep seated crush on Joe Biden? Ah well, they're ALL good--see ya! 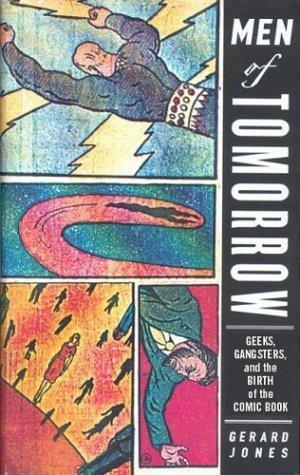 I recently finished reading "Men of Tomorrow: Geeks, Gangsters,and The Birth of The Comic book" by Gerard Jones, and I gotta tell ya, I was tremendously impressed. Believe me when I say that in my time, I have read PLENTY of historical recaps of the genesis of the modern day funny book, but they always seemed to focus primarily on the men who created the material published inside those gaudily colored booklets, making little more than a perfunctory mention of the folks whose cash (clean or otherwise) greased the printing presses. Not so here. Fact is, you're practically a hundred pages into this eminently readable--and scrupulously documented--tome before the pivotal ACTION COMICS #1 hits the stands. Up to that point, Jones clearly defines not only the cultural conditions that prompted Siegel and Shuster to create Superman, but perhaps more revealingly, the events leading up to positioning Harry Donenfeld and Jack Liebowitz to bring the world's original costumed super-hero to the nation's newsstands in the first place. This book, more than anything--and despite a rich array of supporting players (hey, what history of comics would be worth its salt without at least a brief sidebar concerning the homicidal CRIME DOES NOT PAY editor, after all?) --is the story of these four men. leading players in a vivid recounting of a time that, while not all that long ago, might as well be, in many ways, a thousand years past. Amazingly enough, after all these years and all my prior research into the rich--and trivial--minutia of comics' earliest era, I feel as if I FINALLY understand how the whole field came about! And it ain't always the prettiest of pictures, but it sure is--at least in Jones hands--a pretty enthralling one! One side observation: Harry's son, Irwin, had a lot of say regarding editorial matters back in the sixties when I was but a wee lad, regularly plunking down my twelve cents for countless DC titles. Nothing disturbed me more as a young teen, however, than the visually inane Go-Go Checks desecrating the top of each and every book DC published for several years mid-decade. In classic fan-boy fashion, I considered it a virtual crime against humanity, and when I read an interview with Irwin Donenfeld a few scant years back wherein he gleefully claimed credit for that misbegotten decision, even as an adult, I held onto those long-seated feelings of disgust for what he'd perpetrated. Then, in reading Jones' retelling of the Donenfeld family history, I learned that the irrepressible Harry made virtually no time whatsoever for his young son, sending the boys loyal chauffeur off to accompany him to all his Little League games, attending himself only a single time--and then leaving before a mere three innings were completed--well, that threw Irwin Donenfeld into a whole new light for me. I felt really, really bad for the guy, and realized that sometimes, things that happen in our formative years can explain--and even excuse--transgressions made during later times. Yes, folks, even Go-Go Checks. Read the book if you haven't already--you won't be sorry. 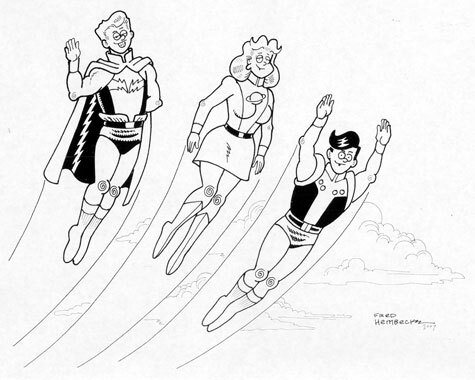 They were the originals: Lightning Lad, Saturn Girl, Cosmic Boy! Okay, I'll admit it--as quirky as my style generally is, there are times when I just feel like amping the odd factor up even further! Hey, when you're talking about guys who dress up like bats, have wings on their ankles, fight crime even though they're blind, and socialize with ants, I ask you--why not? Thus, the above--which can be viewed with even greater clarity by venturing here. All three pieces are currently available over at eBay, gang--here's the links to the LSHers; to Supes and Spidey, and to Ant Man and his associates. 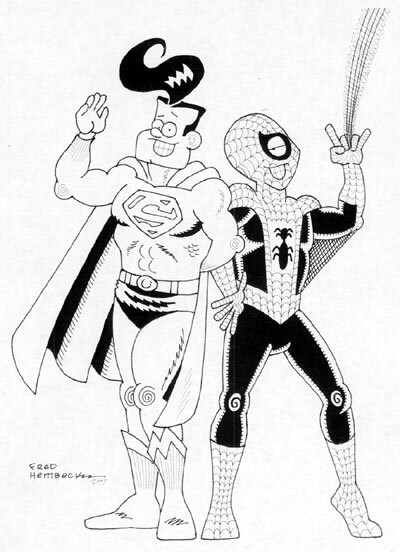 Just a quick note for those of you interested in purchasing some original (well, sorta...) Hembeck art--my take on Steve Ditko and Jack Kirby's revised version of 1963's AMAZING SPIDER-MAN #10 is currently up for auction over on eBay. Last week I offered my redo of Ditko's 26th issue of AMAZING SPIDER-MAN up for bid (check it out here), but made the mistake of not mentioning that li'l fact here on the blog. Maybe that's why it didn't sell (maybe not, true, but hey, that;s the reason I'M going with). So, if any of you are interested in buying that particular piece--or my recent redos of FANTASTIC FOUR 8 and/or 10--I'll happily part with any of 'em for a hundred smackers apiece (plus the customary $17 per mailing P&H fee, natch). Last weekend, I had the distinct pleasure to be a guest at a small, one day comics show held in an Elks Lodge located in my long-ago stomping grounds of Troy, New York. Organizer Phil Sawyer, Jr. made both myself and traveling companion, daughter Julie, feel comfortable and at home, and I'd like to publicly thank him and his associates for making my appearance a fun one! 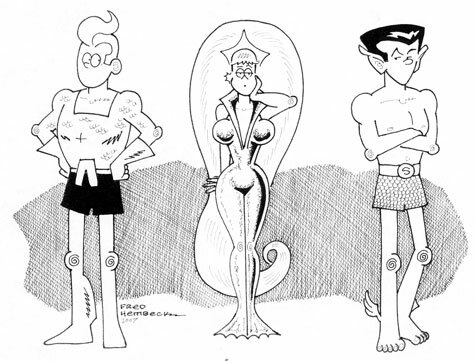 Of course, aside from talking with the friendly con attendees, and meeting Harvey Comics legend, Sid Couchey, what most delighted me was the virtual Fantaco reunion that took place that afternoon: my good friends, Rocco Nigro and Roger Green, made it out to the show together and spent a liberal amount of the morning yakking with yours truly. Albany based Marvel and DC artist, John Hebert--who used to ride his bike past my house in Troy when he was a wee teenager--was another of the guests, as was embellisher deluxe, Bill Anderson. Somehow or another, I'd managed not to see Bill--or even speak with him--for nearly two decades, pretty amazing when you consider that I was the guy who discovered him! Okay, okay--with or without me, Bill was gonna get noticed; he was always that good. But ever since I first saw the samples he'd brought along with him to an early eighties Fantacon, I knew the guy had the goods! What most stunned me was that he was, what, nine at the time, maybe ten, tops? ( Alright, more like fourteen or fifteen, but believe me, that stuff was so smooth and slick, it easily belayed his then-tender years). We became friends, and it became routine after awhile for me to pick up Bill at his folks house to accompany on my weekly comics-seeking jaunts to Fantaco. I even took Bill to his first rock concert (Jonathan Richman, who performed aided only by his guitar and large heeled, percussive, boots, a great show). But more importantly to you lovers of four-color minutia (and I know you're out there! 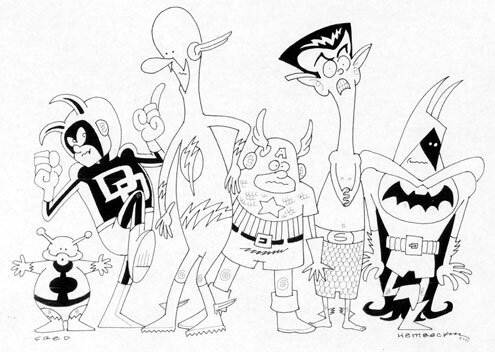 ), I was responsible for getting Bill's work inside the pages of a big time professional comic for the very first time! (I also roped Bill into inking several of my things for various Fantaco publications, all soon to be reprinted in THE NEARLY COMPLETE ESSENTIAL HEMBECK ARCHIVES OMNIBUS--that's your TNCEHAO plug o' the day!). 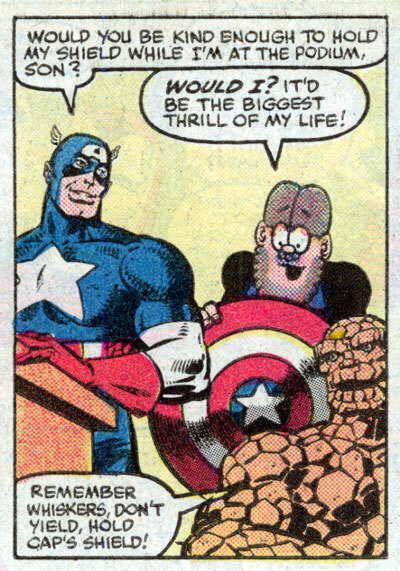 That magic moment came within the pages of 1982's FANTASTIC FOUR ROAST one and only. See that panel up above? It was laid out by moi, Cartoon Fred was pencilled and inked by cartoonist Fred, Cap, his shield, and the Thing were pencilled by Mike Zeck, and Cap and the Thing were inked by John Beatty. And as the comics scholars amongst you in the audience well know, it was all uphill for Bill after such humble (and peculiar) beginnings! It was a delight spending most of last Saturday catching up with Bill, and I promise not to go even another single decade without comparing notes with the Still-Younger-Than-Me Mr. A! Remember how, a while back, I mentioned that I was working on a big hush-hush project, one that'd likely keep my away from posting on this blog nearly as often as in the past? 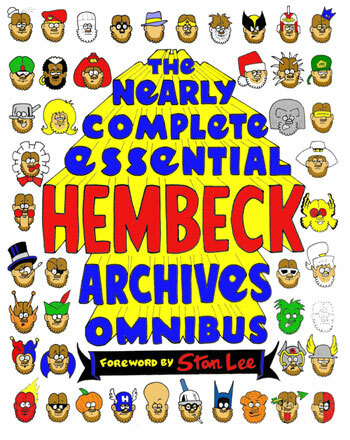 For more details--and a better look at that cover, I direct you to THE NEARLY COMPLETE ESSENTIAL: HEMBECK ARCHIVES OMNIBUS Official Information Page! All you'll need to know regarding this 900 page-plus upcoming Image publication can be found there, nestled on its very own perma-linked page--and I'd sincerely appreciate ANY links that you, my fellow comics bloggers and news mavens, could throw my way towards getting the word out! We spent this past Columbus Day weekend continuing our seemingly endless survey of New York State universities, visiting institutions number six and seven: Hobart and William Smith Colleges (a twofer) in Geneva, and Ithaca's famed Cornell. Hobart and Smith was by far the friendliest and most accommodating school we've visited thus far. Since we arrived for our walking tour nearly an hour early, the folks in administration rustled up a very nice young woman by the name of Laura to give Julie and me a tour all to ourselves!! (Lynn's bad knee has been acting up, so she chose to sit out the hike around campus). This allowed for a lot more genuine interaction between the three of us, and less of the canned recitation that's all too standard. (The very next day, a fellow by the name of Jared gave us--and three other families--a highly practiced speech while walking us around Cornell, the effect being not unlike the spiel cast members on the Disney Jungle Cruise ride repeat by rote on their never ending circle line. Can't fault the kid TOO much, though--at least he didn't come off anywhere near as arrogant as our SUNY Binghamton guide did). Julie later had a interview that was supposed to go a half an hour, but went so well that instead lasted twice that. One of the questions she was asked was, "If you could have dinner with any two people, who would you choose? ", and her answer was John Lennon and Richard Fineman. To which I replied when she reiterated her discussion to us later, "Oh, you mean the Beatle and the guy from the Three Stooges?". In fact, I use that line EVERY single time she invokes Richard Fineman's name--which she has, often, ever since she took Physics last year. (In case you didn't know--I sure didn't--he's a really, really famous physicist. 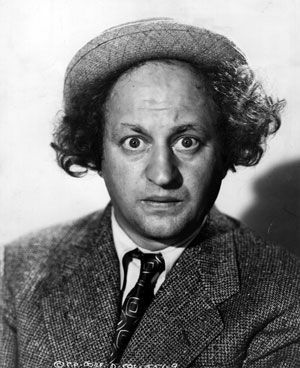 But hey, Julie doesn't know who Larry Fine is, so I guess that makes us even, huh?...) (Okay, not really. but if you throw in her similar ignorance of Shemp, Joe Besser, and Curly Joe, maybe that'll tip the scales a little my way, hmm?...). Our visit to Cornell the next day coincided with that of none other than the Dalai Lama! Really--I'm not kidding! But we were way too busy with our own schedule to stop over where he was delivering his lecture and say "Hello, Dalai!"! But at least his otherwise unexpected presence (at least by us) gave me the opportunity to make that awful joke--and not just once, I can assure you! Cornell's an extremely large school, but they very cordially made time for us, giving us the straight scoop on both the physics and fine art departments, the two favored fields of Little Miss Potential Double Major (good luck, kid...). Last item of note was the drive home. Midway through, just as it was getting dark, the rain--which had previously been coming down slow, then pretty steady--morphed into a near blinding downpour with our daughter at the wheel on NY's Route 17! There was nowhere to stop to switch over to a more experienced pilot, so, with Paul McCartney warbling "With A Little Luck" on the CD player (Julie's latest musical obsession, much to her dad's delight), I silently seconded Macca's sentiments, and watched from the edge of my seat as our neophyte driver did her best to get us all home in one piece. And she did! In fact, she was just absolutely great during that difficult stretch of road, and I'm doubtful I could've done better (the ol' eyes ain't what they usta be, ya see...). Maybe I'm amazed we all made it home safe and sound, but I shouldn't be--we obviously had the spirit of Richard Fineman watching over us! Well, not exactly, fellows, as the above illo attempts to clearly demonstrate. 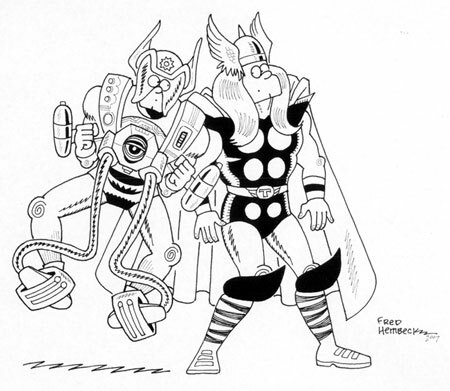 Sure, they were both creations flowing from the fertile mind of the great Jack Kirby--and there WAS an All-father and a Highfather involved as well--but Orion and Thor wouldn't exactly be confused with being blood brothers, despite their similarities, dig? Y'know, I've always been fascinated with the notion of complementary characters from different publishing houses getting together, such as our pair of Number One Sons above. 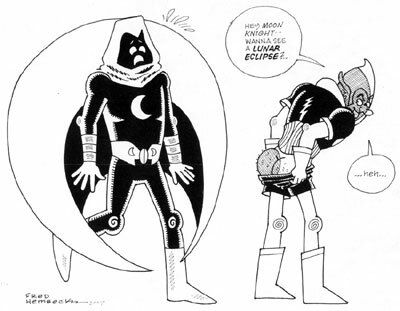 Want a closer look at the dark side of Eclipso's moon? Go here--if you dare!! (Check here for an expanded version, friends). Y'know, the first time I came across Ben Grimm--aka The Thing--he seemed like a truly scary guy. That would've been in the opening pages of FANTASTIC FOUR #4, where Reed, Sue, and the reluctant Grimm plotted their course of action in an attempt to locate the teenage member of the quartet, who'd run off at the end of the previous issue. And no wonder The Thing was less than enthused regarding their new-found mission--HE'D been the one to chase off the combustible Johnny Storm in the first place! So when the orange scaled strongman finally found the Human Torch, he certainly didn't greet his erstwhile teammate (you should pardon the expression) warmly! Nope--he practically bit the kid's head off! And he maintained that dangerous aura in the next two FF's that I read (6 and 7--I wouldn't get a peak at number 5 until it was reprinted in the second Annual), as well as the few grumbling cameos he made in the earliest episodes of the Torch's solo STRANGE TALES series. That was the issue where The Thing first met Alicia Masters, the blind daughter of the FF's latest foe, The Puppet Master, and the days of seriously worrying that Ben Grimm was going to rip the noggin off the neck of one of his companions was over and done with, once and for all. For one thing, as much as I absolutely love Artie Simek's display lettering, that bubbly, rounded style he used here for the story's title never looked serious enough to me. For another, the color scheme relied far too heavily on grays, oranges, and that sickly yellowish hue substituting for the actual skin tone of the giant looming mug of the baddie de jour'. And about The Puppet Master, well, I just thought he looked ridiculous. That impossibly expansive grin was bad enough, but what really irritated me were those overly exaggerated eye lashes surrounding his peepers. I realize now--and i even realized then--that the idea was to make the guy look like a human wooden dummy, but the sorry truth was, to me, it just made him look effeminate! Hey, I was only nine years old at the time! Nowadays, that sorta look wouldn't make me blink twice--no homophobia here, friends. 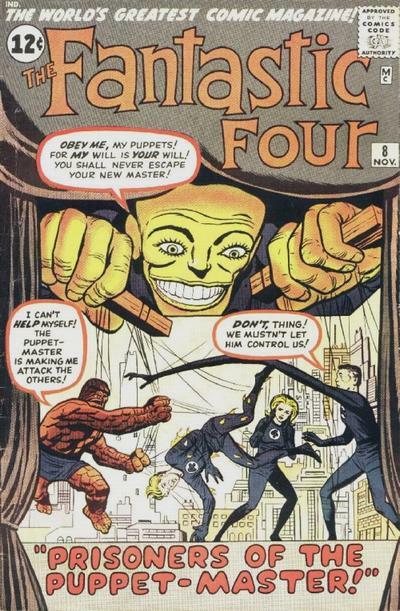 But back in 1962, this just looked...odd to me--even without taking in to account the whole symbolic nature of the giant Puppet Master controlling Ant-Man sized members of the FF, a scene that doesn't come anywhere close to occurring inside the pages of FF#8. But a closer look at the cover recently made me stop and consider THIS semi-inspired notion--wouldn't something that's already THIS goofy looking make for a particularly interesting Hembeck Classic Cover Redo? 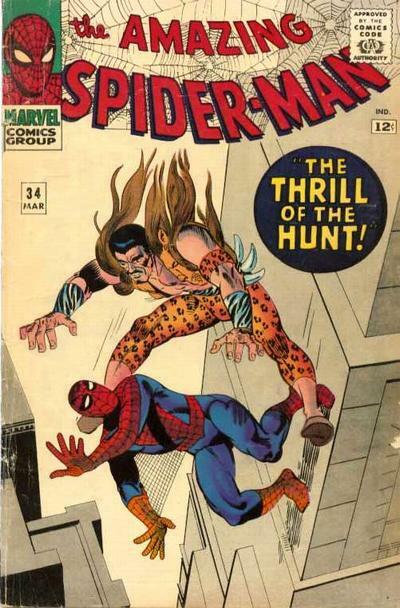 Like on the cover of AMAZING SPIDER-MAN #34.. No real story to tell here, just more hangover from my recent rhapsodic rereading of the Ditko canon within the pages of the SPIDEY OMNIBUS. In fact, I've decided to make it my goal to eventually redo each and every Spidey cover Sturdy Steve did way back when (I'm more than halfway there already--out of a possible 43 covers (including two unpublished alternates), I've chalked up 26. And counting...). So here's the return of Kraven, squiggles included. Thank you, one and all--but especially YOU, Steve and Jack!